In these days of touchscreen always-connected smartphones, it is easy to forget that some people want something that is much simpler and straightforward to use. Nokia haven't forgotten this, however, and the Nokia 206 is very much a traditional format phone that can still do some of the more advanced things when needed. This is an attractive device with a fresh take on Nokia's classic designs. On the front is a standard number pad with a 2.4" 240 x 320 pixel non-touch display on the top. On the back is a very basic 1.3 megapixel camera. In addition, the Nokia 206 has Bluetooth, a 3.5mm audio socket with a stereo wired headset in the standard sales package. The Nokia 206 is a Series 40 feature phone rather than a smartphone, but it does come with a web browser, instant messaging applications, a media sharing app plus other basic applications that are downloadable from the Nokia store. This is a GPRS/EDGE phone only with no 3G data, although the Nokia Xpress enhanced web browser is designed to make the phone more efficient over a slower connection. The relatively large 1100 mAh battery gives up to 20 days talktime and up to 47 days standby time - compare this with most smartphones that need to be recharged on a regular basis and you can see the advantages of keeping it simple. There are two versions of the 206 available, a dual-SIM and a single-SIM model, both of which appeared to be priced at €62 before tax and subsidy. The dual-SIM version has a shorter standby time of 20 days and comes in two dual-band variants, but is otherwise pretty much identical. 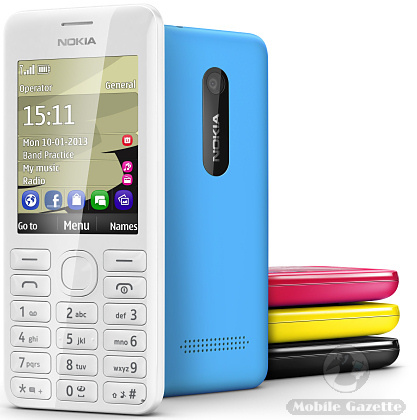 Nokia say that both version of the 206 should be available by the end of the year in cyan, magenta, yellow, black and white colours.